We offer free international shipping. Over a thousand years of craftsmanship have inspired the final form of the Kamikoto 神箏 Kanpeki Knife Set. Meticulously handcrafted, each blade features high-quality steel from Honshu 本州, Japan – a steel with high corrosion resistance and durability. The Kanpeki Knife Set is rigorously quality tested to ensure that it meets the distinction and caliber of Kamikoto 神箏. The Kamikoto 神箏 Kanpeki Knife Set includes one vegetable knife, one slicing knife, and one utility knife to tackle the smaller, more intricate chores in the kitchen. Each knife is precision balanced and weighted for optimal form and long-lasting performance. The Nakiri vegetable knife is 7 inches long, the slicing knife is 8.5 inches long, and the utility knife is 5 inches long. Kanpeki blades are single bevel 片刃 Kata-ha. Both handle and blade are satin finished to a subtle, yet stunning luster. The Kamikoto 神箏 Kanpeki Knife Set is presented in a natural-colored ash wood box for safe storage and keeping. Crafted by employing methods from centuries-old traditions, the Kamikoto Toishi Sharpening Whetstone is specifically primed to hone and sharpen single bevel Japanese steel knives. The sturdy bamboo stand has been formed to hold the whetstone firmly in place during the entire sharpening process, allowing for the control necessary to form the perfect chiselled edge. The Toishi Sharpening Whetstone features two sides with different grits; the 1000 grit side is the coarser side, utilized specifically to grind away at the rougher edge produced over multiple uses of a knife. The other side consists of a finer 3000 grit for polishing and finishing the edge of a blade, the final step in a sharpening cycle. How Kamikoto can offer such great value? Thanks to the Direct-to-Consumer Model. These knives are beautiful. I was a bit skeptical trying them as I love my knife set and research extensively before I add to my collection. As soon as I picked up the nakiri, the weight and balance told me I was going to love it. Anything I cut with the nakiri feels like slicing through soft butter with that wonderful blade. We are so impressed with the Kamikoto knives. They are of both extremely high quality whilst being functional and appropriate for everyday kitchen use. We would highly recommend them for professional and home use. You can feel the precision and old tradition of knife making simply by holding these knives in your hand. The weight and balance of these knives are perfectly designed as they truly feel like an extension of your hand with each razor sharp cut. I bought these knives based on the reviews on the web. As you can all see, the reviews are very positive. So, I purchased these with VERY high expectations. I was reluctant based on how expensive these knives are. After using them now for several months I am blow away by the quality of these. It has changed my whole view of how important great knives make to my meal preparation. I can say without reservation that these knives are a bargain. These are a great investment in yourself and your family. Man, are these sharp! Recommend these without reservation. I bought this wonderful knife on faith. I was told in March when it would ship. I received emails alerting me that my knife would be arriving as promised. It came early, thanks! Tthe quality and feel of the knife exceeded my wildest dreams. I lived in Tsubami ahi where knives are hand forged. This has a place amongst the best. I have it on display for now as I view it as a supreme work of art. Thanks to the legacy at Kamikoto, I'm the proud owner of the last cooking knives I will ever need. Strong, perfectly balanced, comfortable and beautifully designed. Kamikoto has truly exceeded all expectations. Along with a superior product comes excellent customer service. Every inquiry was answered quickly and diligently. The moment these blades are removed from their casing you can feel the craftsmanship. But it's when you put them to the counter they truly sing. I will enjoy my Kamikoto blades for the rest of my life. Thank you from Hawaii !! Isaac S.
From the moment I ordered the knife set, I was emailed every step of the way till they were delivered. When I opened the box I instantly knew I made the correct decision. The weight, balance and edge were perfect. A few of my friends have handled them as well and all have asked the same question. How can I get these. I highly recommend these knives. I will definitely be purchasing additional knives from this company. The quality and customer service was excellent. I purchased these for a gift and they arrived in time and were even expedited by then at no request from me. Great purchase experience. My order came in incomplete. I contacted the company and had a response within a couple hours. They immediately responded, researched and started the replacement process. I had my order replacement within 1 week or so. Every email was answered the same day. I so highly recommend this company. LOVE MY PRODUCT AND LOVE THE SERVICE MORE. GREAT COMPANY. I got this (along with the santoku) for my dad as a Christmas gift. He collects knives, and doesn't mind cooking with them either. The packaging was lovely. He claims they are some of the sharpest knives he's ever worked with before, and was quite impressed. I purchased this set as a gift to myself and my wife we both love to cook . It’s only been a couple of months we use them almost every day and the knives are excellent they are razor-sharp but I highly recommend you order the Whetstone for keeping them that way. I’ve used many different knives sets over my life and these seem to be by for the best quality. This was a gift for my grandson who is in culinary school. He absolutely loves them! I have used the knives a couple of times since receiving them. Razor sharp, no imperfections noticed. I don't know why I waited so long to purchase high end cutlery and these knives work beautifully. When I use your amazing knives it is a pleasure to cook. Each is perfectly balanced with a beautifully honed blade. They are a worthy investment. We received the three knives and they are as advertised. We have enjoyed using them since we received them a month ago. These knives were recommended to me by a Seattle chef and they are incredible. I look forward to all my prep work as they are a joy to use. The handles are perfect, so comfortable. My recent purchase of Kanpeki Knife Set is one of the best decisions I’ve made. I couldn’t be happier with these knives. They are outstandingly beautiful and very functional. They have terrific weight and balance and very sharp. Kamikoto knives carry a limited lifetime guarantee for the lifetime of the product. Blades crafted in the hands of true masters, they are skillfully forged to serve you generations over. Learn more about it here. I have had my knives for a few months now. Love them. The quality and precision is phenomenal. The blades are very sharp and are everything they claim to be. I could not be happier. The knife is clearly excellent quality. I immediately noticed the difference in the feel in my hand and the way the steel went through anything I was cutting. The feel was far different than any other knife I've ever used. Highly recommended. These Senshi dual knives complete my Kamikoto sets. The Honshu steel, craftsmanship, design and balance are perfect. I was a chef for 13 years and have many beautiful knives, but these are my favorites! I'll cherish them for life, and pass them to my next generation! Thank you Kamikoto! 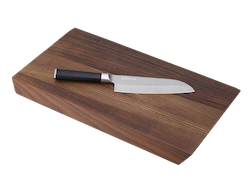 An outstanding product From the opening of the presentation box to the first slice of the first tomato, the luster and sheen of the Honshu steel is a joy to behold. The blades are as sharp as can be imagined, if not... more so. The balance and beauty of the knives is perfect and I’m totally in love with this purchase. I have been a professional chef for over 30 years and have owned some great knives. The Kanpeki Knife Set is unquestionably the best knives I have ever owned. There is nothing I don't love about these knives. I just ordered the 7-inch Santoku Chef's knife. You can't go wrong with these knives. I was delighted to discover, on opening my recently purchased Kanpeki knife set, single-edged blades. I had never used single-edged blades in the kitchen. I was pleasantly surprised to find each knife was so versatile. Able to do the most delicate cutting, to the workhorse of basic slicing and dicing. I am pleased to say, I will be purchasing the remaining knives and whetstone. I first received my Kamikoto knife as a gift. I have found my new favorite knife! I am very pleased with the balanced grip, which in itself is a work of ergonomic art. I have never used a single bevel blade before and, after a bit of experimenting, find it an improvement for several tasks. Based on my experience with the Kamikoto knife, I purchased the Knife Set for my son who is a graduate chef of many years experience. He also is very pleased with his gift. A well made and Versatile Chef's Knife I received this in 2 days with prime, and it arrived in perfect shape.This is a marvelous Chefs knife! I find it well balanced, and very sharp.It does require some knowledge on how to sharpen the one-sided bevel on the blade, but once you learn it's easy to maintain a razor sharp edge! I also really appreciate the wood box it comes in.The slight curve of the blade also makes it ideal to ""rock"" when finely chopping herbs. Very Pleased. I’ve been a chef for 40 years and have owned many of the best knives on the market. Workmanship, balance and edge on my Kamikoto is superb, most Excellent! Even the packaging is a cut above, has its own wooden box and the packaging around the box was wrapped thoughtfully and carefully. Highly recommended! 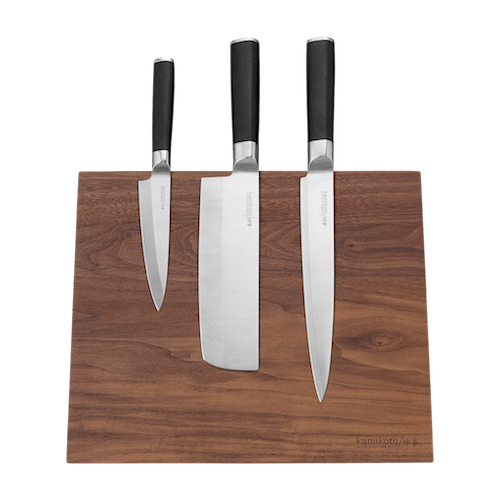 We love this knife set. Even our dog sitter mentioned how much she liked them (she's a professional cook). We pulled the foam out of the beautiful box and set that in a drawer to keep them protected. We got rid of a lot of other knives and don't miss them a bit. The set was purchased as a wedding gift. They were floored when they opened the beautiful wooden gift box. The groom is a professional chef and was very complimentary of the expert craftsmanship. What is the shipping time? We allow 24 hours after a client places an order before the order is processed and shipped. Clients have 24 hours to notify our team regarding any changes they wish to make to their order. We would ask that our clients allow 5 business days for the item to arrive to their home from the time that they receive the shipping confirmation email. Do the lengths stated in the description refer to the full knife or just the blade? The dimensions on the product page refer to the length of the blade only. How do you sharpen the knives? 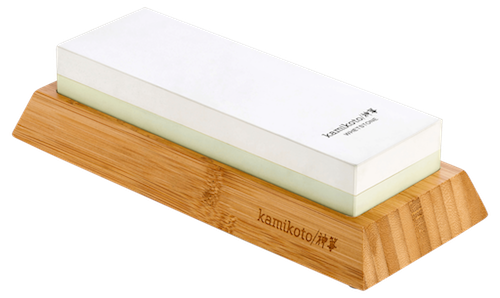 We recommend that customers invest in Kamikoto’s Toishi Sharpening Whetstone to keep handcrafted knives sharp and ready to cut. The Toishi Sharpening Whetstone sits on a beautiful wooden bamboo stand and features two sides – one with a coarse grit to grind away any roughness, and the other with a fine grit that sharpens and polishes the edge. The finer the grit, the finer the edge on your knife. 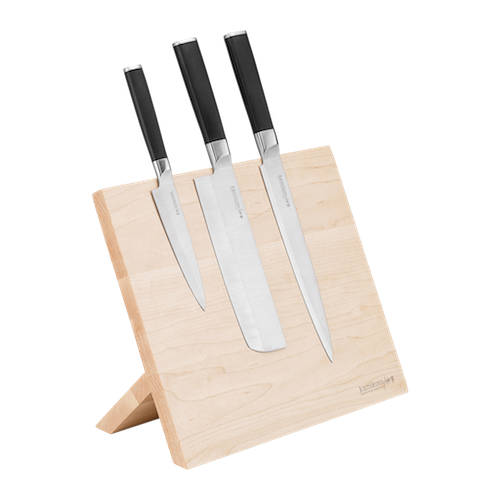 The sturdy wooden stand holds the whetstone safely in place so you can concentrate on gaining the sharpest edge possible. Click here to see full set of instructions. Do you have knives made for left-handed users? At the moment we only offer knives for right-handed users. However, we are looking into an option for our left-handed clients. Are the knives dishwasher safe? Do not place handcrafted knives in the dishwasher. This is because knives and cutlery rub against each other or against other objects during the wash cycle – this can leave scratches, damage the blade or damage the plastic finish on the cutlery basket. All product and company names are trademarks™ or registered® trademarks of their respective holders. Use of them does not imply any affiliation with or endorsement by them. We are not affiliated, associated, authorised, endorsed by, or in any way officially connected with The Wall Street Journal , or any of its subsidiaries or its affiliates.